HONG KONG—A Hong Kong National team took on University of Waikato Chiefs Development Squad at Hong Kong Football Club on Saturday April 23, as part in a day full of Rugby starting at 8am and going right through until the evening. The main event in the evening was the annual Taipan challenge. Mini Rugby matches took place all morning, followed by an Operation Breakthrough match against HK Colts, then a game between HK Disciplined Services and a HK Selection, the annual Varsity match between Northern and Southern Hemispheres, then HK against Waikato Chiefs Development Squad (Waikato Chiefs), and after a HK Police Pipe and Drum Band the Taipan’s match. 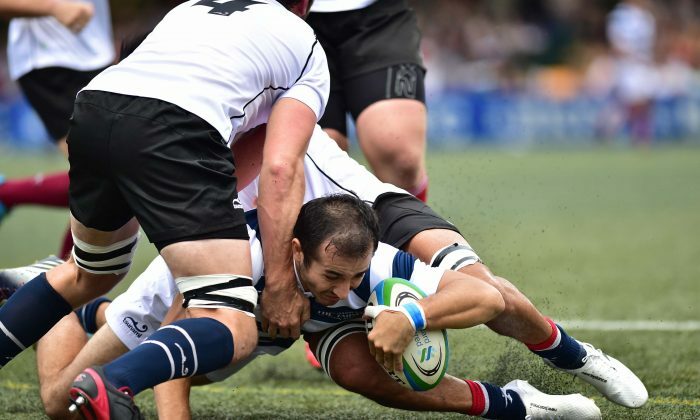 Although all were fully entertaining and holding a special meaning for sections of spectators, the two top featured matches were the Chiefs against Hong Kong kicking off at 3:45 and the annual Taipan’s match starting at 17:30. As might be expected the Waikato Chiefs, the development squad of a top Super Rugby team were young, very fit, selected for their rugby talent, still learning but well-groomed in the art of the game. The squad was well up to the task of taking on the Hong Kong Nations team. This is the second time they have visited Hong Kong staying almost a week on this trip. The 27 strong Waikato Chiefs squad trained alongside the Hong Kong national players and with members of Hong Kong’s wider development player pool prior to Saturday’s friendly against Hong Kong. They also visited and trained at the recently opened Rugby 15’s Elite Training Centre. The Waikato Chiefs players are drawn from the Chiefs region of Provincial Union counties of Manukau, Waikato, Bay of Plenty and Taranaki in New Zealand. handling to put their scrum-half over for their first try. Although near the sideline the conversion seemed just a formality for the strong-kicking full back to take a 7-3 lead. In the early stages it looked like the Waikato Chiefs would run away with the game, but perhaps too eager to show their paces, they made needless errors while in attack and were penalized on many occasions. Another error in a kickable position allowed Hong Kong to pick up a second penalty to make the score 6-7 at half time. It was not until the last quarter of the match that the Chiefs showed their real talent. A penalty to Chiefs on 57 minutes moved the score to 10-6, then 2 tries in the next 10 minutes to take the score to 24-6. By this time they were in full flow. Another two tries including an 80 metre run for the line gave Chiefs a final score of 38-6. Hong Kong battled gamely, and had some good attacking moves but Waikato Chiefs also demonstrated their defensive skills and speed of recovery to deny Hong Kong a further score. The annual Taipan’s challenge match dates back to 1951 as an annual match between a team hosted by the Commander of the British Forces in Hong Kong and one for a business leader (the Taipan). Since the British forces pulled out in 1997 the match took a break until it was reintroduced in 2011. The new format is one team representing the Taipan playing another selected by a stalwart of the HK Rugby community (the Challenger). This year the Taipan was John Slosar, Chairman Swire Group and the Challenger New Zealand Peter Duncan. The team selections for this match were spot on, resulting in fast moving open rugby with both teams fully committed. Initially it looked like the Taipans were too strong dominating play in the opening 10 minutes and running in 2 tries to put 12 points on the board. It all looked too easy, with the challengers not very coordinated and coming under continual pressure, but the game changed as soon as the Challengers got better organized, running in a try for 12-5 after 15 minutes of play. The Challengers pushed over for another try on the 23rd minute, questioned by the Taipan’s who thought the ball was not grounded, but the try stood leveling the score at 12-12. Taipans made a strong attack in an attempt to regain the lead but a pass interception by the Challengers took the play back into the Taipans half and with strong deceptive runs by several of the Challengers players, out maneuvered the Taipans for another score. 12-19. The Challengers continued to press forward but a breakaway by Taipans put their No. 7 over to reduce the gap to 17-19 at half time. The second half was 40 minutes of high quality, providing immense entertainment to all who watched – Rugby not often witnessed and at its best. A try by Taipans on 57 minutes was converted for a 24-19 lead. A further try by Taipans on 34 minutes took their lead to 31-19. Many good moves and close calls continued but that was the winning score with Taipans triumphant. A reversal of last year’s result when the Challengers just edged Taipans 43-41.